Helen Simonson's The Summer before the War is hard to put down, esp. since the main character is a Latin teacher (I used to teach Latin and Greek before I came to editing). NYT review here. 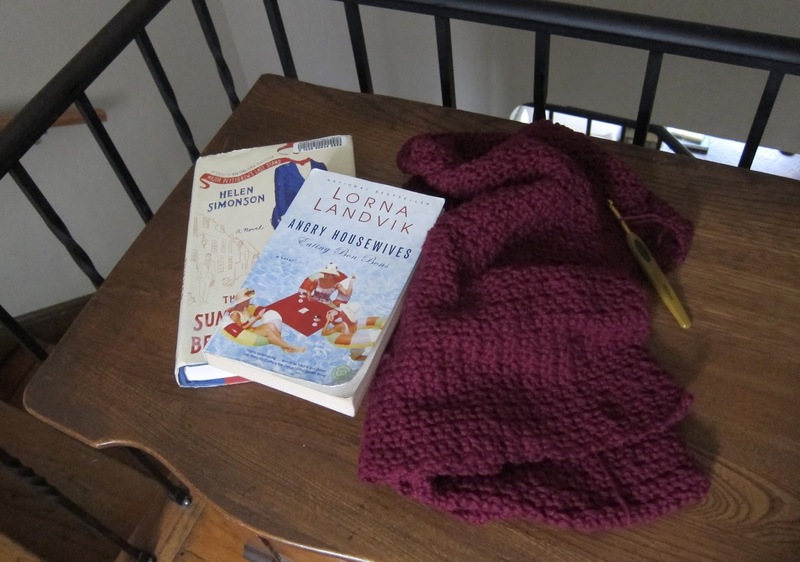 Lorna Landvik's Angry Housewives Eating Bon Bons is a book club pick, and it has made me nostalgic for Minnesota. It has also made me think about my mother, who was a young wife and mother in Minneapolis around the same time, and just how much things have changed, while still staying the same. Worth a read -- not quite the fluff the cover would lead you to believe, but a familiar story. Coming to it with a deep knowledge of the setting has made me enjoy it far more than this reviewer did. The magenta crochet number is a Tiramisu blanket (free pattern!) that is working up quickly. It's the perfect companion to snuggling up on the couch and binge-watching Catastrophe. I'm using Knit Picks Comfy Worsted in Fairy Tale -- a fitting name for a baby blanket for a dear friend who's expecting twins.